Close followers of Don R. Campbell, and his approach to strategic real estate investing, know he’s not a big advocate of looking at just average selling prices. Rather, pinpointing facts around an area’s Gross Domestic Product and population growth is his key to spotting undervalued markets that are only set to skyrocket in value in the future – rather than markets that are already super hot right now. So while investors searching for maximum ROI in up-and-coming areas largely aim to keep clear of competitive seller’s markets and heated bidding wars, run-of-the-mill buyers who are looking to balance lifestyle goals with owning a strong real estate asset are subject to exactly those conditions. Especially in the Greater Toronto Area. Arguably Canada’s hottest housing market, the GTA has seen a huge spike in the number of bidding wars and over asking home sales over the past few years. Headlines around homes selling for as much as $400,000 to even $1 million over asking regularly capture people’s attention (even though there’s some considerable under pricing in those cases) and today, experience with bidding wars has become a necessary part of an agent’s repertoire. 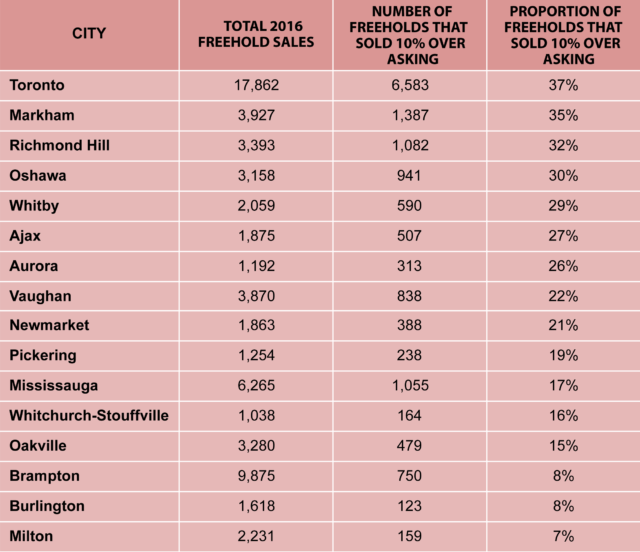 To illustrate just how competitive the GTA market has become, TheRedPin looked into how many freehold homes across the metropolis sold for at least 10% over their original list price in 2016. The brokerage found a whopping 22 per cent of family homes sold for at least 10% over list price last calendar year, a huge 160 per cent spike from 2015. Below is a chart that highlights where the most and least over asking sales occurred in major GTA cities. As expected, the City of Toronto took the top spot. Unlike freeholds, the GTA’s condo market saw considerably fewer properties close for at least 10% over list price (around 2 per cent of total sales). Even in the downtown core (MLS Community C1: which includes neighbourhoods like the Bay Street Corridor and parts of Liberty Village) saw only around 1 in 50 high rises fetch a minimum of 10% over their asking price.